Do you recall seeing this picture on the Sweet Baby Love Quilt post? To re-cap the first step in making this project click on the the title above. I used the +Silhouette America Cameo to cut out the shapes. I carefully blanket stitched around each animal shape with a small stitch length to finish the edges. The Room is styled with Pottery Barn Baby Harper bedding, which inspired the theme, and colors of the baby showers from the family. While testing the placement of pieces on the fabric, the puzzle was harder than I thought. The biggest problem was to not overlap similar colors, causing the the cut designs disappear. My first thought was all four fabrics square shaped meeting at the center. 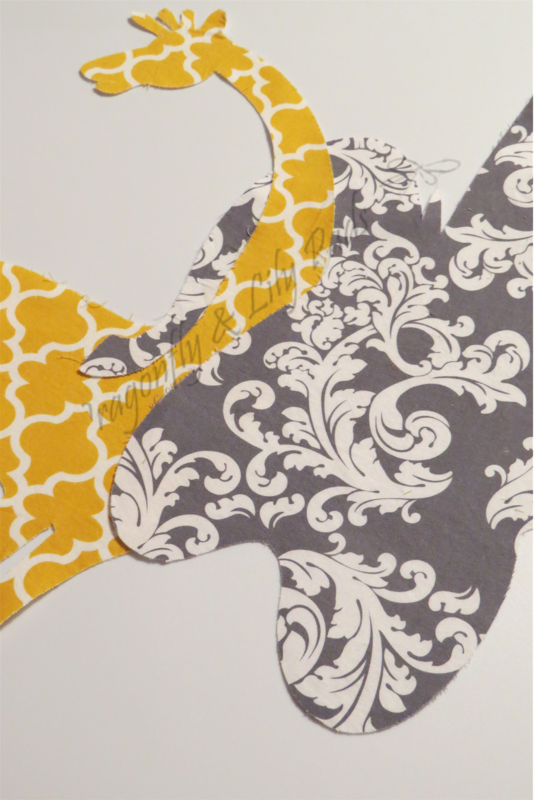 I had cut the shape of the giraffe and elephant in the two prints already. The pieces blended right into the quilt top. Not the effect I was trying to achieve! 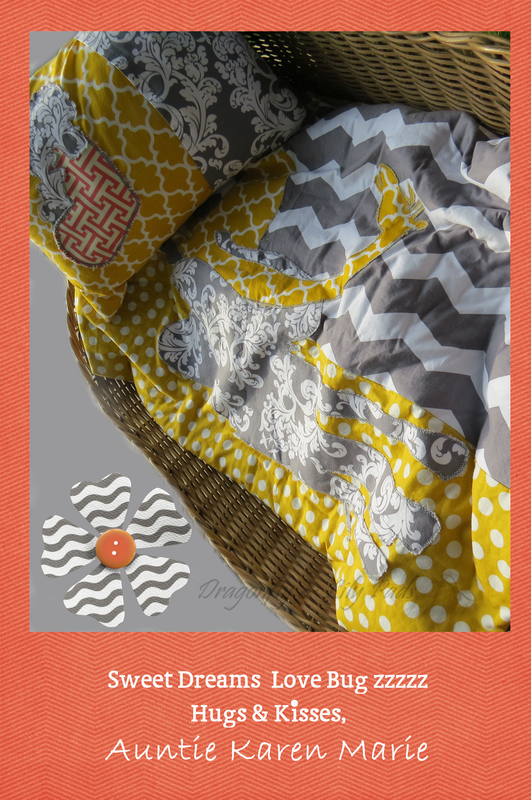 Finally I came up with the centered split of the two remaining prints, yellow polka dot and gray chevron as the top of the quilt. Right sides together, straight stitched seam down the center, created the top of the quilt. I carefully pinned the two appliques centering it in place with the neck of the giraffe and trunk of the elephant intertwined. This was tricky to get each shape down without moving the other one out of place. I straight stitched with gray thread to attach the appliques to the top of the quilt. After attaching the two shapes, I added topstitching details to the animals. I feel like the detailing added to this piece. I placed right side together of the backing (gray soft flannel), the complete top, and laid the thin batting as a third layer. Carefully stitching together all three layers making sure to catch all of them is important. If you miss a layer you will have open seams in your quilt, or your batting might move. Start sewing the layers around the quilt together on three sides. The final side stitch 1/4 in from each corner leaving the center open to turn the quilt right side out. Trim the batting close to the seam allowance. Trim the fabric seam allowance, remembering to leave the seam allowance for the opening, and clip corners to take the bulk out of the edge. After turning the quilt right sides out, make sure to push the corners to square. Press the entire piece folding the seam allowance and pressing a fold of the open seam. Then top stitch the edge with gray thread, which will close the remaining opening. Start the second row of top stitching all around the entire quilt. I chose thin batting because, it is a warm climate where they live but, nights can be chilly. I am pleased to announce that the recipient of this Quilt is a happy healthy baby....Girl. She is thriving, and of course Great Auntie Karen Marie is over the moon in love with our new girl in the family. I love being an Auntie to many nieces & nephews. When I say many, I mean more than enough to field 4 baseball teams. Each one brings me such joy in life. When I made the pillow, I knew we were blessed with a little girl. I had already hand cut the swirl, stitching the edge when I did the other appliques. I chose this coral fabric, cut the shape of the heart by hand, and blanket stitched the edge with the gray thread to outline the shape. Played with the two shapes until I liked the design. I used the material the elephant and giraffe are made of to balance the fabric. I cut a rectangular shape coral fabric in half right sides together. Stitched a straight stitch down the open edge, turned it right side out and stitched it again. I tied it into a bow, and hand sewed it to the storage bin I purchased at +Jo-Ann Fabric and Craft Stores as a bow for the elephant. 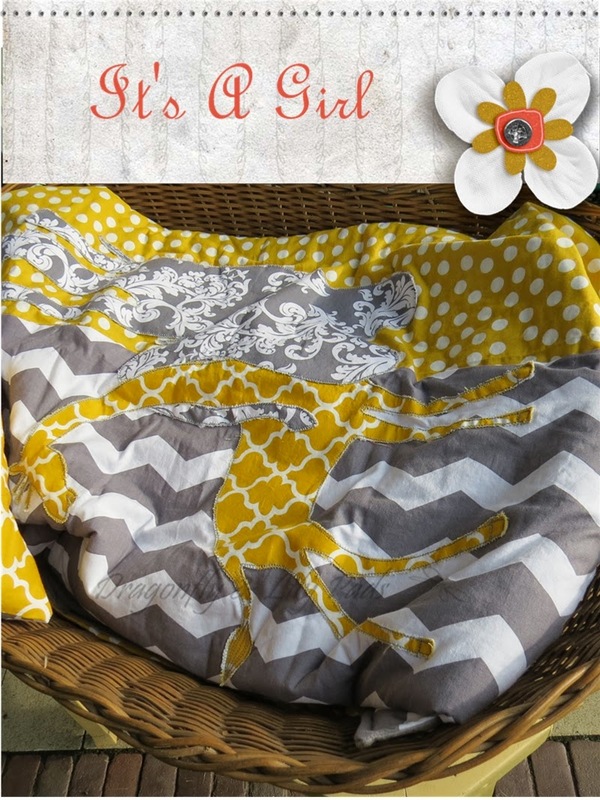 The coral fabric adds just the right amount of whimsy to this gift. 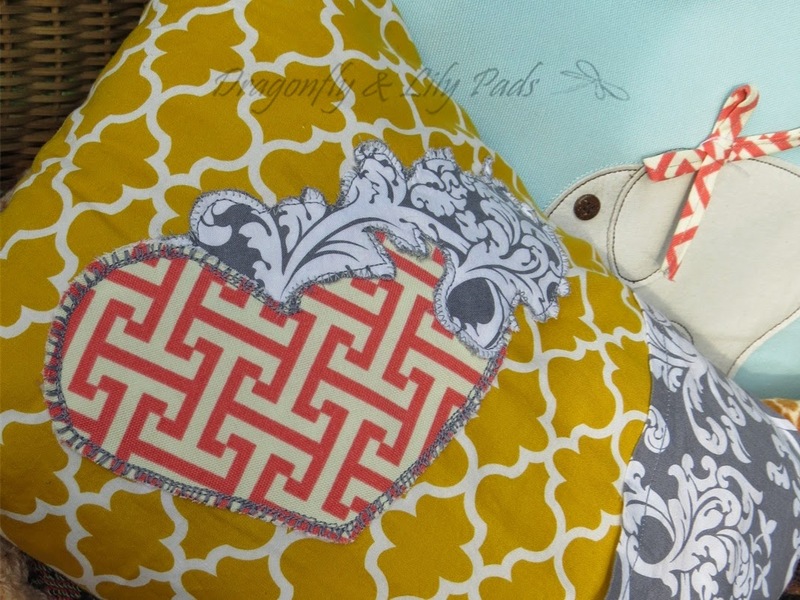 The pillow is reversible with the back done in the gray print. I did this by cutting the Gray fabric 1 2/3 of the pillow. The yellow print is cut to three quarters of the front. I hem one end of each rectangle with a straight stitch. 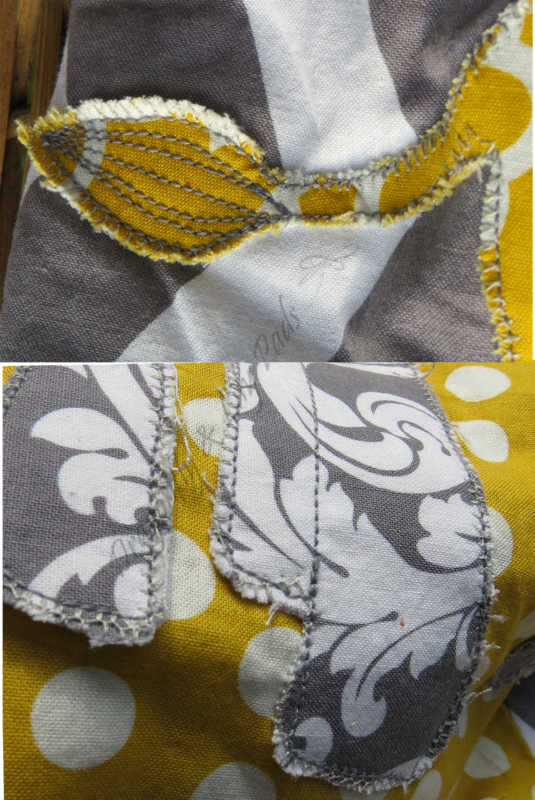 Then place the fabric right sides together pinning the yellow and gray unfinished edge together first. Fold the longer gray portion back over the gray wrong side together. Stitch using the straight stitch again on all three sides of unfinished edges. Turn the pillow right side out and with three straight stitches you have made an envelope pillow. 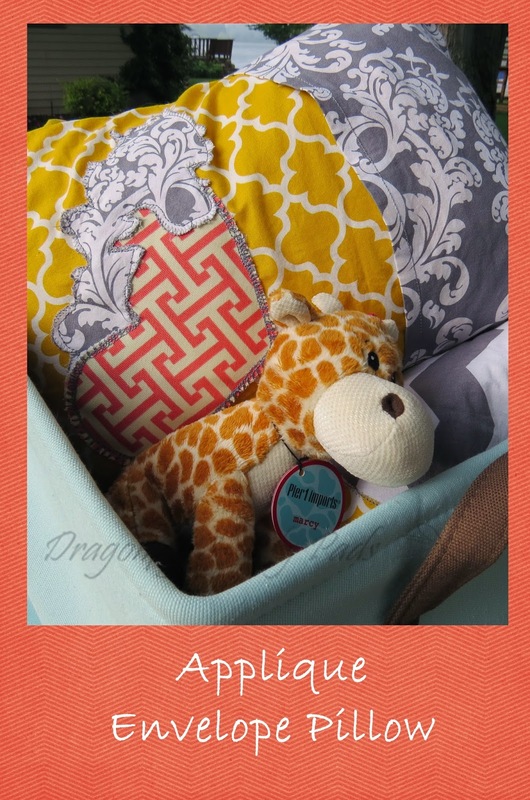 Marcy the giraffe from +Pier 1 Imports finished this gift basket to snuggle with at night. Wow! That was a lot of information for one day. 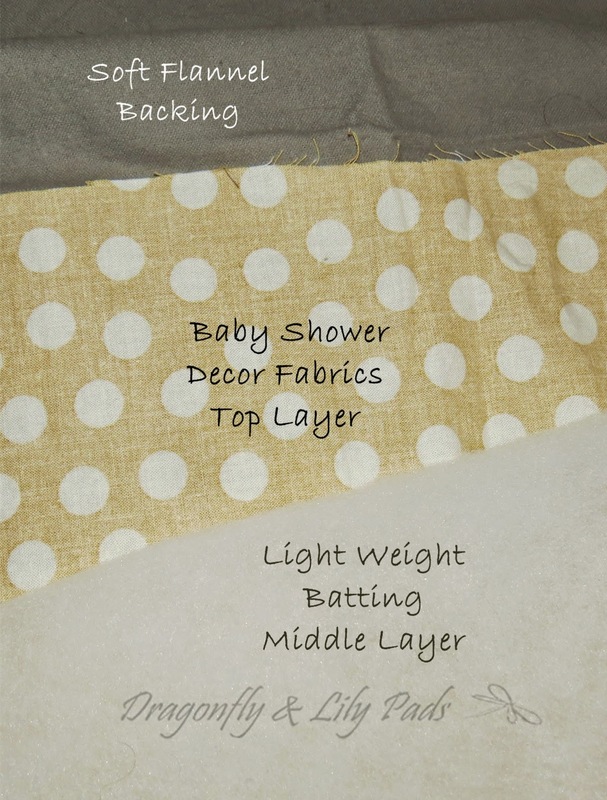 Here is the Sweet Baby Love Quilt link one more time. This post is dedicated to my great niece. I wish all her dreams come true, as she snuggles under her quilt. This fabric has been touched by family and friends, at the baby showers. I have been given the honor of designing and stitching all that love together in the quilt. 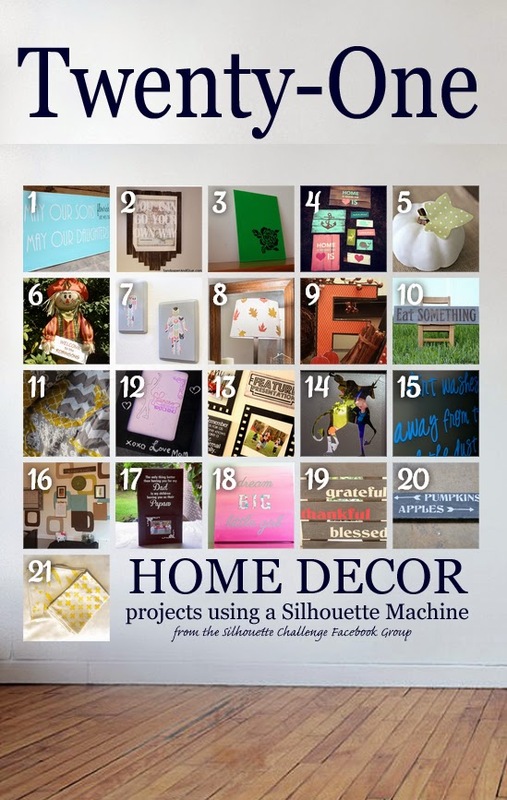 I invite you to enjoy 20 more Fabulous Home Decor projects created by my Silhouette Challenge Buddies. This is gorgeous!!! Love your color/fabric choices. This is a beautiful project! I know that baby will treasure it! Thank you for the compliment about my Quilt. I am thrilled with how it turned out. It was so nice of you to take the time to comment. Thank you for sending your sweet note about the quilt for the new baby in our family. It was a joy to make. Karen this turned out beautiful and I love the fabric as well. I may have told you this before but I just love the yellow and grey combination!! This is adorable! I love the colors, and the pattern. It turned out amazing! Thank you for the sweet comment you left about the quilt I made for my niece. Thank you for leaving a lovely note about my quilt project. I think the colors are happy too. I hope our new little one is snuggled, loved, and happy. I am thrilled that you like the quilt. I am so glad you like my quilt. Our new little ones Mom & Dad loved it too. Wow this is amazing! This makes me wish I knew how to sew so I could use my Silhouette in this way! Great challenge! I am so glad you came by to visit. I learned to sew from my Grandmother & Mother, sharing the quilt brings me so much joy. I love traditions. Spectacular project. So much love! Thanks for sharing! Karen, Your Sweet Baby Love Quilt is adorable. The color scheme is perfect! Karen you have talent and great color sense. This is gorgeous! !!! Thank you! I have given the quilt to my great niece. I am over the moon in love. Thank you for your sweet comment. I love a party.